Ghana US Naval Partnering – Hosting a US Sea Base? Ms Julie Furuta-Toy, Deputy Chief of Mission at the US Embassy in Ghana presented certificates on the boats to Lieutenant-General Joseph Henry Smith (rtd), Minister of Defense, at a ceremony at the Western Naval Command in Sekondi. Lt-General Smith thanked the US Government for the gift, which he said is an expression of the cordial relationship between the two countries and hoped the friendship between the two countries would be further strengthened. He spoke of the economic, social and security assistance the country has received from US government over the years, saying that, Ghana had received security assistance such as the International Military Education and Training (IMET) and the African Contingency Training Assistance (ACOTA) programmes. 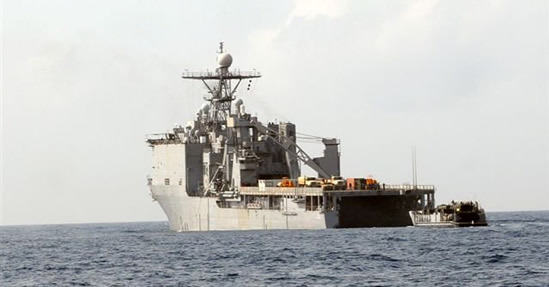 Lt-General Smith said USS Gunston Hall; a US Naval is presently berthed at the Western Naval Command for the 2010 Africa Partnership Training Programme. He said the government is committed to equipping the Ghana Navy, to play a pivotal role in the protection of the countries maritime resources, especially fisheries stock and the oil find. He said steps were being taken to complete the Slipway and the Test bench Projects at the Sekondi Naval Dockyard to enhance fleet maintenance and ensure availability of ships to perform assigned roles. Miss Furuta-Toy said the four boats are meant to augment three defender boats presented to the Ghana Navy in October 2008. She said the US is proud of its multi-national military partnerships, and that from 2008 to 2009, five West and Central African Countries received 17 identical defender class boats. The United States Africa Command is collaborating with the Ghana navy to patrol the country’s high seas. The naval commands say the surveillance has become necessary to check increasing illegal activities such as drug trafficking, fishing and dumping of waste along the West coast. The project will also involve training for Ghana’s Navy and logistical support. Joy FM’s Sammy Darko will be on the patrol ship and he believes the trip will be a challenging one. The capacity of the Ghana Navy is soon expected to be boosted to a level where they can ward off most illegal activities on the high seas. In recent times, concerns have been raised about the country’s inability to combat drug traffickers, illegal fishing and dumping of waste on the high seas. That is because the Navy lacks the equipment and required skills to do so. But the US Africa Command is hoping to reverse the trend with its African partnership station. The object of this program is to improve maritime safety and security on the African continent. Under the program, officers of the Ghana Navy will be given professional training and provided with some logistics to aid in patrol offshore. For instance, under this exercise the US has given Ghana four defender class boats for surveillance. These are fast speed boats attached to a vessel to chase out criminals on the high seas. The training is considered crucial as the nation prepares to sell its oil in commercial quantities in the last quarter of this year. So for the next eight days, my job on this trip will be to observe and if possible, assist in the arrest of criminals. Seventeen Ghanaian Navy officers and sailors are receiving training on how to secure the nations maritime boundary on a US naval ship currently on sail on the gulf of Guinea. Also onboard the ship are navy officers from other West African countries. The idea is to pull together synergy on how to check insecurity on the African waters in recent times. 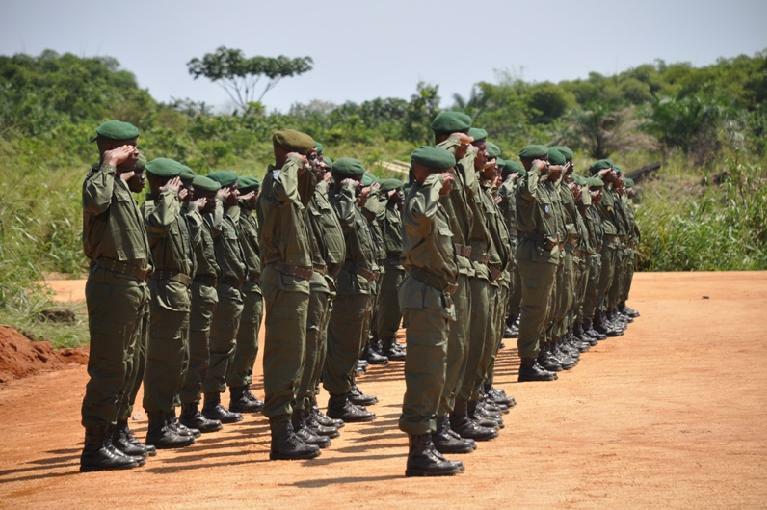 The training is being organized by the United States naval forces Africa and its partners under a program code named African partnership station. The reporter is currently onboard the USS Gunston hall currently enroute to Sao Tome and Principe to deliver some items. It will take us roughly four days to get there. To give you an idea about the ship I am on, picture two football fields put together, that is how big this ship is. It is a well equipped vessel. Inside this ship are several lecture halls where naval officers from Ghana and other West African countries are undergoing tutorials on a wide range of maritime courses with emphasis on professional development, respond capabilities, and infrastructural development. Some of the students tell me the lessons have been very useful. ” I have learnt how to administer first aid to any of my offers if they were to suffer injury- A ghanaian naval officer said”. For the next seven days, trainees are expected to also undergo practical training as we sail to Sao Tome and back to Tema. There is no question that both the training and equipment are useful and much needed in Ghana. The drug trade plus trade in other contraband, the illegal fishing and dumping are a plague on Ghanaian shores and all African shores. The US military is actively targeting Africa. With a seabase, the US may have the equivalent of a base in Ghana, without an actual land base. All the arrows point to Africa in the USMC map of the future global security environment pictured below. You can read the planning and the rational in the text on the graphic, also reprinted below. Of course a great deal of US policy is exacerbating these problems rather than helping resolve them, as discussed in many contexts over several years on this blog. 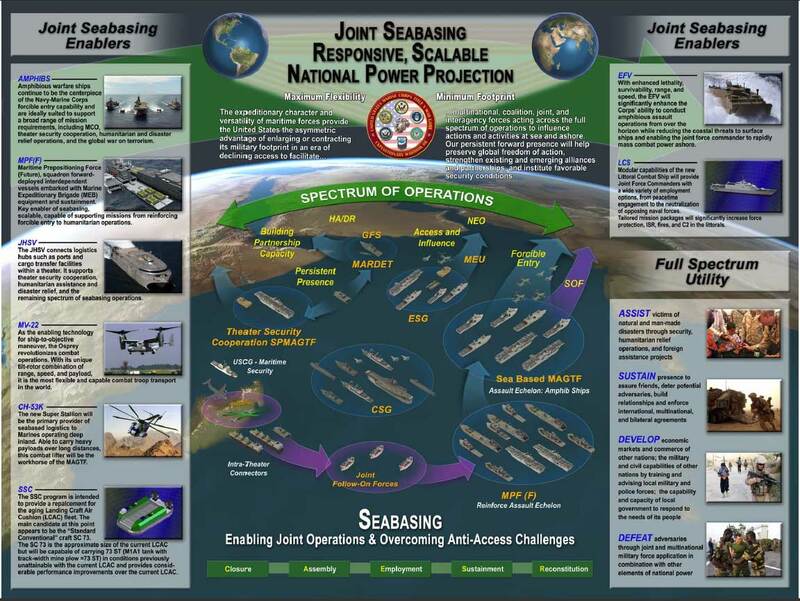 The African Partnership Station is an active part of the seabase concept The original of the above graphic is at Seabasing Concepts and Programs PDF, but it may not be possible to connect from IP addresses outside the US. As you can see from the words along the bottom, they are preparing for a war they expect to last at least 2o years. 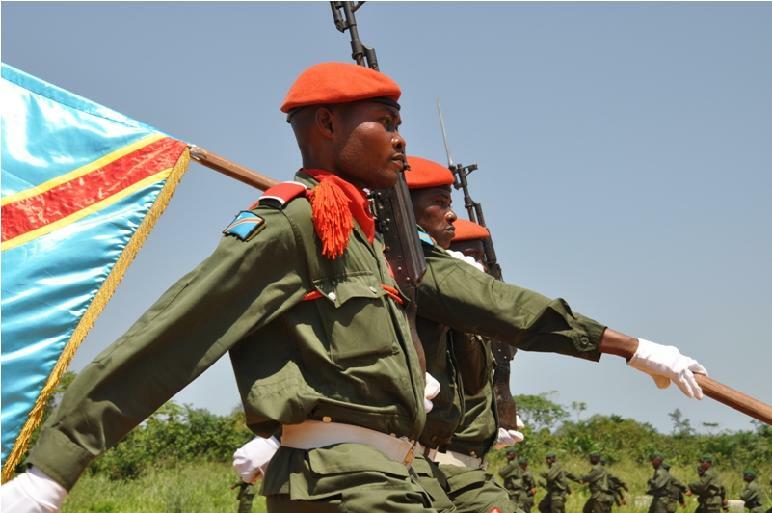 As has been discussed on this blog many times, in respect to many countries, much of this war will be self fulfilling prophecy, the result of militarization: training, and arming the continent. The US sees sea basing as the way to use its military to police and control the world, and particularly the oil and other resources it covets from Africa. And because the US military is overextended, they will be using military contractors for a lot of this arming and training activity, making them even less accountable. Imagine a future where the people of countries at odds with U.S. policies suddenly find America’s “massive seaborne platforms” floating just outside their territorial waters. Azaa Amerika. Atta Mill, shine your eyes. Ghanaman ,the US has double standards and hidden motives…warn president mills and the Ghana Navy…Look at this illegal drugs…the most drugs are here in the US and the Carribean route ……don’t let this stupid marines fool you…Ghanaman. USA IN GHANA? am sad!!!¬!! USA oooooh? am supprised they are here too. is because of the oil oooooh Ghana. very soon we will start fight over the oil and they will start selling guns to us at the exchange of oil. USA. is our leaders really reading between two lines at all. … apart from food and other humanitarian aid to victim nations of natural disasters, nothing really goes out of the US free without satisfying the American interest. It is strange why Africans expect things free. I think it’s about time we Africans understand that when somebody gives you a gift, the purpose is mostly to compromise your decision making. so why should Africans expect something free from America without giving back anyting in return? Most often, it is more dangerous to recieve gifts without a clear cut condition than those with clearly stated conditions, in that sense you can negotiate well and once you meet those conditions you become free. US have been sharing gifts with the Sekondi Naval Base since time immemorial. africa command in ghana. mmmm. us naval base in ghana. The following is a huge graphic that portrays the entire global seabasing concept. There are humanitarian activities that are part of this concept, but they are there to serve the military objective. Acronyms from this graphic are listed below. 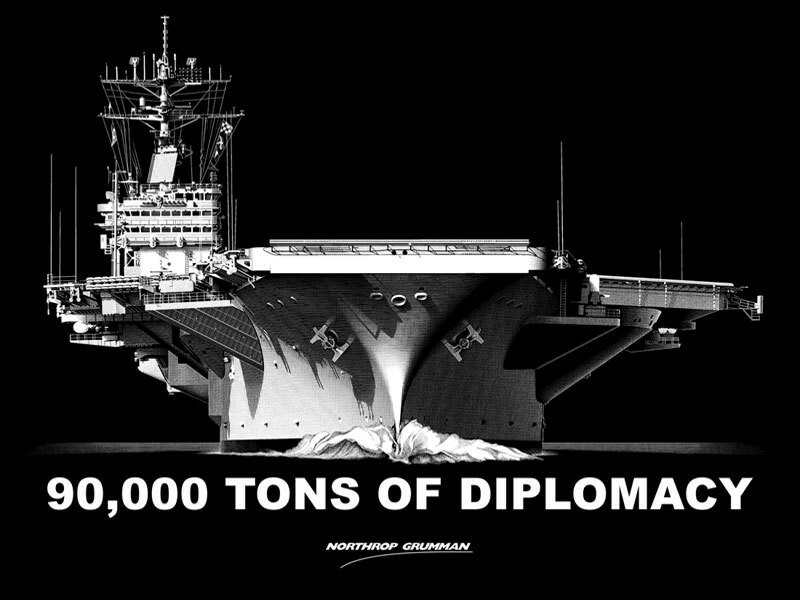 90,000 tons of diplomacy is just the beginning. … the United States is now totally frank about putting its cards on the table. … Its official declared policy is now defined as ‘full spectrum dominance’. That is not my term, it is theirs. ‘Full spectrum dominance’ means control of land, sea, air and space and all attendant resources. 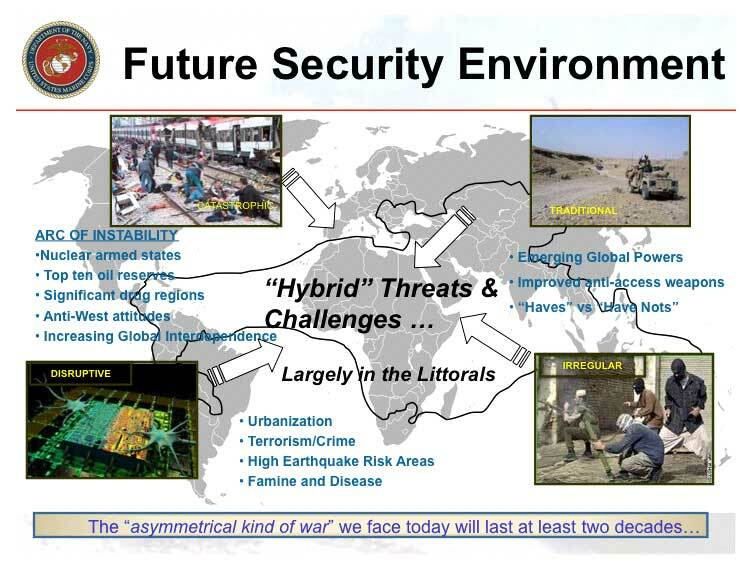 The Pentagon sees security as a full spectrum global operation, as illustrated in the slide below from a linked document, Seabasing Concepts and Programs PDF . They project at least 2 decades of war, based mainly in coastal areas, the littorals, all around the world. 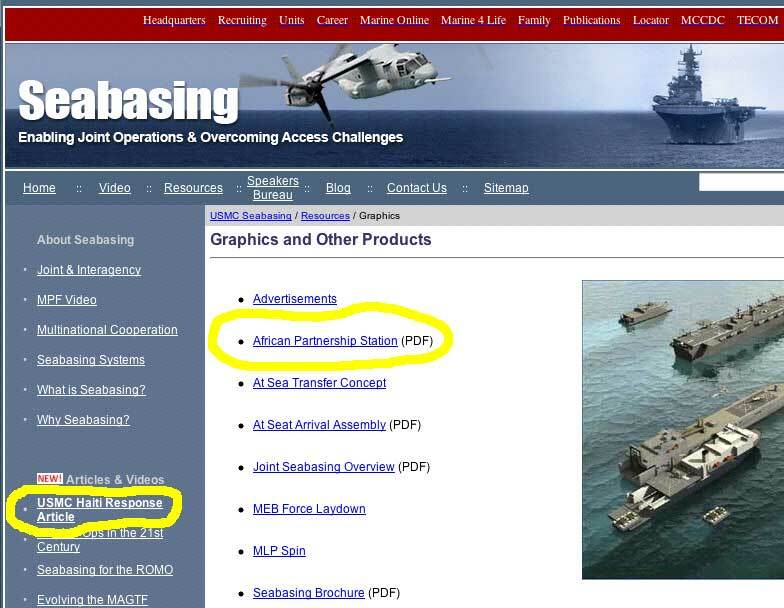 Documents and videos linked to the above page cover various aspects of seabasing. Clearly this is war, not a humanitarian mission. That is why it is called a war and assigned to the military. The military may engage in humanitarian exercises, but the threat is represented as a military security threat. The real reason for the global militarization is controlling resources and containing potential rivals. Africa is a central target because of its vast resources, oil, mineral, land, water, and more. Labeling almost the entire continent as part of the Arc of Instability demonstrates an intent to keep the continent destabilized. The intent to destabilize is particularly evident in North Africa where the US has Lied Into the War On Terror in the Sahara. The security environment pictured shows the US fears south south alliances and trade, alliances and trade that bypass the United States entirely. The big emerging economies are China, India, Brazil, Mexico, Indonesia, and Turkey. Along with Russia, these make up the largest 7 emerging economies, the E7. Q: Somalia had every reason to succeed: an advantageous geographical situation, oil, ores and only one religion and one language for the whole territory; a rare phenomenon in Africa. 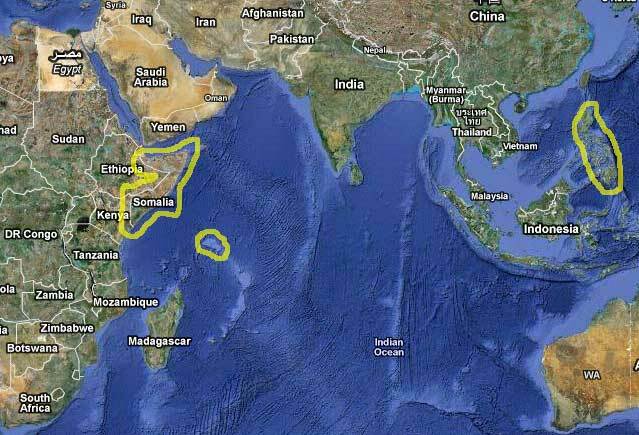 Somalia could have been a great power in the region. But the reality is completely different: famine, wars, lootings, piracy, bomb attacks. How did this country sink? Why has there been no Somali government for approximately twenty years? MH: Since 1990, there has been no government in Somalia. The country is in the hands of warlords. 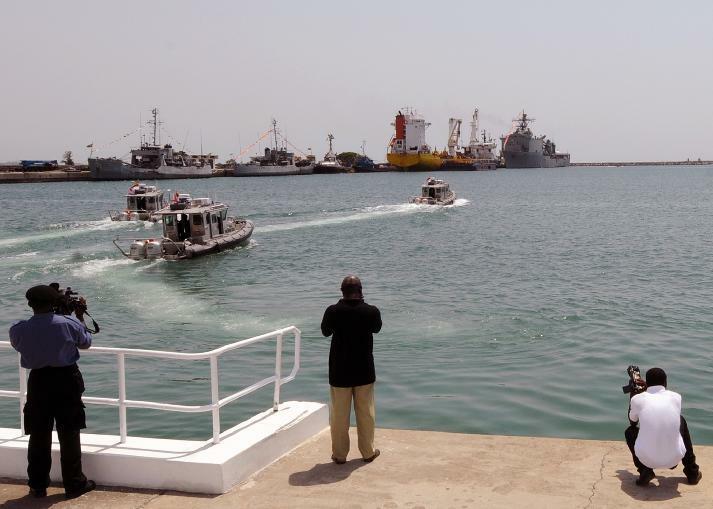 European and Asiatic ships took advantage of this chaotic situation and fished along the Somali coast without a license or respect for elementary rules. They did not observe the quotas in force in their own country to protect the species and they used fishing techniques –even bombs!- that created huge damages to the wealth of the Somali seas. Q: No Somali state for almost twenty years! How is that possible? MH: This is the result of an American strategy. In 1990, the country was bruised by conflicts, famine and lootings; the state collapsed. Facing this situation, the United States, who discovered oil in Somalia a few years ago, launched Operation Restore Hope in 1992. For the first time, US marines intervened in Africa to take control of a country. It was also the first time that a military invasion was launched in the name of humanitarian interference. Q: Why is it strategic? MH: The issue is the control of the Indian Ocean. Look at the maps. As mentioned, western powers have an important share of the responsibility in the Somali piracy development. But instead of telling the truth and paying compensation for what they did, those powers criminalize the phenomena in order to justify their position in the region. Under the pretext of fighting the piracy, NATO is positioning its navy in the Indian Ocean. Q: What is the real goal? MH: To control the economic development of the emerging powers, mainly India and China. Half of the world’s container traffic and 70% of the total traffic of petroleum products passes through the Indian Ocean. 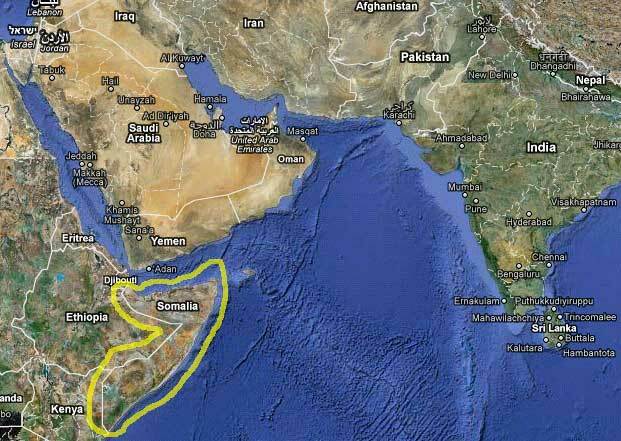 From that strategic point of view, Somalia is a very important place: the country has the longest coast of Africa (3.300 km) and faces the Arabian Gulf and the Straight of Hormuz, two key points of the region economy. Moreover, if a pacific response is brought to the Somali problem, relations between African in one hand, and India and China on the other hand, could develop through the Indian Ocean. Those American competitors could then have influence in that African area. Mozambique, Kenya, Madagascar, Tanzania, Zanzibar, South Africa etc. All those countries connected to the Indian Ocean could gain easy access to the Asian market and develop fruitful economic relationship. Nelson Mandela, when he was president of South Africa, had mentioned the need of an Indian Ocean revolution, with new economic relationships. The United States and Europe do not want this project. That is why they prefer to keep Somalia unstable. Countries have noticed the US actions and intentions. South Africa, India, and Brazil have cooperated in joint naval exercises. The American war on terrorism has provided the US an excellent justification to hasten its reestablishment of a strategic presence in Southeast Asia … Combating Islamic terrorism in this region [Southeast Asia] carried a secondary benefit for the United States: it positioned the US for the future containment of nearby China. In Latin America the US intends to contain Brazil and Venezuela. In February 2010 the US released a USGS report indicating that Venezuela now has larger oil reserves than Saudi Arabia. It is heavy crude, but still recoverable and refinable. One of the techniques of containment is stability operations, in fact these stability operations help keep the countries surrounding Brazil and Venezuela destabilized and in conflict. If you look at the Arc of Instability, you will note that it clings around the borders of Brazil. Direct invasion of a sovereign state has never in fact been America’s favoured method. In the main, it has preferred what it has described as ‘low intensity conflict’. Low intensity conflict means that thousands of people die but slower than if you dropped a bomb on them in one fell swoop. It means that you infect the heart of the country, that you establish a malignant growth and watch the gangrene bloom. When the populace has been subdued – or beaten to death – the same thing – and your own friends, the military and the great corporations, sit comfortably in power, you go before the camera and say that democracy has prevailed. “Bit by bit, quietly, like a spider weaving its web in the middle of the night, an impressive military circle threatens Venezuela and, by extension, the entire group of progressive governments in Latin America,” writes Ignacio Ramonet in the January issue of Le Monde Diplomatique. A recent study by the United States Geological Survey (USGS) established that the Bolivarian Republic of Venezuela, thanks to recent discoveries in the Orinoco Belt, now possesses 513 reserve billion barrels of crude, accessible with “current technology.” Venezuela thus replaces Saudi Arabia, which “only” has 266 billion barrels, as possessor of the world’s largest oil reserves. The article by Ramonet and the USGS conclusion are based on solid evidence. It is not the first time that it has been estimated that Venezuela’s reserves have are truly enormous. The crucial difference is that this time the confirmation comes from a North-American agency, not just from the Bolivarian employees. In effect, the USGS report effectively doubles the reserves in Venezuela’s domain. As for Ramonet’s contention, various developments in the region in recent months seem to substantiate it: in March 2009, we discovered that Colombia had allowed the United States to take over and control seven military bases; in June 2009 political turmoil resulted in the coup in Honduras where the United States has the military base of Soto Cano; in Oct. 2009 the president of Panama, Ricardo Martinelli, announced the concession of four military bases to the Pentagon. The total number of U.S. bases, including the two bases in Aruba and Curacao (Dutch Antilles), to the north and east of Venezuela to date number 13. The current rapid conversion of Haiti into a gigantic aircraft carrier incorporating the 4th Fleet will no doubt soon add another. To the south is the whole Andean region, which includes not only Venezuela but above all, Brazil. In the last few weeks, a few important issues have come to light … On Jan. 20, 2010, the British newspaper The Financial Times published a comparative list of the 10 top banks in the world in terms of market capitilization for the year 2000 and again for 2009. The results are shocking. In 2000, five of the top 10 were American: Bank of New York, Mellon, Morgan Stanley, Citigroup, Wells Fargo, and Goldman Sachs were placed in first, third, fourth, and fifth respectively. In second place was the British bank Lloyds. In other words, out of the top 10, the top five were American and British. The crème de la crème of financial power rested in Wall Street and the City of London, and in other Western countries. Only nine years later, the view has changed dramatically: in the top 10 banks five are Chinese: China Merchants Bank, China Citic Bank, ICBC, and China Construction (nos. 1-4), Bank of Communications (no.6), and three Brazilian banks: Itau Unibanco (no. 5), Bradesco (no. 7) and Banco do Brasil (no. 9). The former giants of banking have sunk. Goldman Sachs now sits at no. 22 on the list and JP Morgan Chase at 31. While the Wall Street banks dropped massively in value, the Chinese banks doubled their value in 2009. “The result of the turbulence is the dramatic shift in the financial center of gravity,” concludes the Financial Times. A large proportion of these banks, like Banco do Brasil and three of the Chinese banks, are state-owned, an interesting Copernican twist to this financial adjustment away from the capitalist nucleus which had its base in the United States. To complete the picture, it is necessary to look at the vulnerability of countries regarding their public and private debt and their GDP (gross domestic product), as tabled by LEAP (the European Laboratory of Political Anticipation) in December 2009. In first place in terms of vulnerability is Iceland, followed closely by various smaller Baltic and Eastern European states, Greece in fifth place, and Spain in sixth. In ninth and tenth places are Great Britain and the United States, where the federal debt is dangerously close to 100% of GDP. In the United States, the combined private and public debt is triple the annual GDP. If these countries had been South American, they would have defaulted on their sovereign debt, and some analysts predict that this eventuality is not far off. … Pricewaterhouse Coopers released figures that indicate a dramatic twist on the global stage. It predicts that in 2020, the G7 (the United States, Japan, France, Germany, the UK, Italy, and Canada) will have an economic weight equal to that of the emerging nations, recently christened the E7: China, India, Brazil, Russia, Mexico, Indonesia, and Turkey. In this global power reshuffling, Brazil is very well positioned. Its enviable situation in terms of energy self-sufficiency, due to possessing large untapped reserves of both oil and uranium, makes it unique in the global superpower game. Brazil has understood the essence of the game plan of the United States. The Pentagon has dedicated to Brazil the same strategy it uses to contain China: to fan the fires of conflict on its borders in order to destabilize and prevent its ascent. It is the same logic which has transferred the center of military gravity from Iraq to Afghanistan and Pakistan. Seen in this context, it is easier to understand what is happening in Latin America, of which the massive militarization of Haiti is the latest chapter. Haiti is the first step in the operations of the 4th Fleet. Taking the predicted calamities caused by climate change in the near future into account, the operation in Haiti will provide a template for what is to come in this decade. In South America, the United States Southern Command military installations surround Brazil in the Andean region to the west and south. The powder keg lies in the Colombian-Venezuelan and Colombian-Ecuadorian conflicts, which have the potential to ignite the whole region. The tension generated by the Colombian attack on the encampment of Raul Reyes on Ecuadorian soil has been exacerbated by the de facto occupation of Haiti. Latin America is marching toward an unprecedented increased militarization of international relations which, with the exception of Brazil, it is neither psychologically nor physically prepared to defend itself from. With the US in debt, and failing to invest in itself to create growth, how long and how well will it be able to sustain the present military expansion? Is the US now doing to itself what it did to the former Soviet Union, amping up the threats, and forcing itself to spend itself into bankruptcy with military spending? It is certain to be able to cause a great deal more destabilization and destruction throughout the world before that might happen. … the flag follows the dollar and the soldiers follow the flag. The same is equally true today. The only change is that what was Super-Nationalistic-Capitalism is now Super-Globalistic-Capitalism. People should not have to suffer and die all around the globe so that a few rich can become richer. Genuine diplomacy and mutually beneficial trade agreements are both preferable and still possible. Here in the US, in what is supposed to be the beacon of democracy, I hardly hear any voices calling for this. 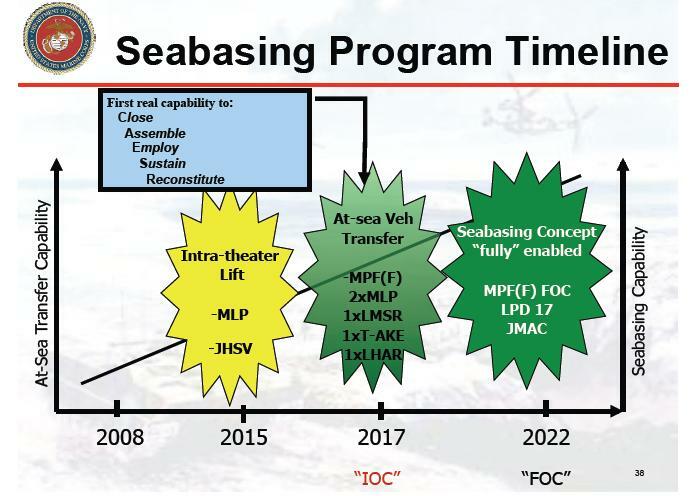 To summarize seabasing, from a US Marine Corps Seabasing Brochure (PDF). on ports or airfields ashore. Extremists may be those who legitimately disagree with US policies. The flow of commerce that needs protection is commerce that advantages the United States, commerce that advantages those who wield corporate power over the US government. And for a graphic that pulls together the entire Seabasing concept here is Joint Seabasing Overview, PDF. 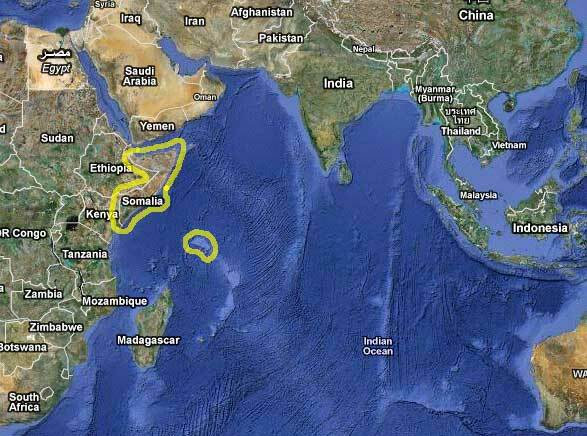 Notice that the Spectrum of Operations pictured arches across the top of the Indian Ocean, from Somalia through the Arabian peninsula, through western Asia and down towards India and south Asia. You will also see the enabling air and sea equipment pictured, and text describing the Full Spectrum Utility of seabasing. And this is where the mercenaries come in. Security is a necessity for the development of human rights. But outsourcing security to private military contractors has not proven beneficial in the U.S. or any other country. The current US program under which armed security companies work for the State Department in Iraq—the Worldwide Personal Protection Program—has its roots in Haiti during the Clinton administration. In 1994, private US forces, such as DynCorp, became a staple of US operations in the country following the overthrow of Jean Bertrand Aristide by CIA-backed death squads. That help, however, is coming in the form of neoliberal shock. With the collapse of the Haitian government, popular organizations of the poor, precisely the ones that propelled Jean-Bertrand Aristide to the presidency twice on a platform of social and economic justice, know that the detailed U.S. and UN plans in the works for “recovery” – sweatshops, land grabs and privatization – are part of the same system of economic slavery they’ve been fighting against for more than 200 years. A new occupation of Haiti — the third in the last 16 years — fits within the U.S. doctrine of rollback in Latin America: support for the coup in Honduras, seven new military bases in Colombia, hostility toward Bolivia and Venezuela. Related to that, the United States wants to ensure that Haiti not pose the “threat of a good example” by pursuing an independent path, as it tried to under President Aristide — which is why he was toppled twice, in 1991 and 2004, in U.S.-backed coups. This is the crux of the situation. Despite all the terror inflicted on Haiti by the United States, particularly in the last 20 years — two coups followed each time by the slaughter of thousands of activists and innocents by U.S.-armed death squads — the strongest social and political force in Haiti today is probably the organisations populaires (OPs) that are the backbone of the Fanmi Lavalas party of deposed President Jean-Bertrand Aristide. Twice last year, after legislative elections were scheduled that banned Fanmi Lavalas, boycotts were organized by the party. In the April and June polls the abstention rate each time was reported to be at least 89 percent. It is the OPs, while devastated and destitute, that are filling the void and remain the strongest voice against economic colonization. Thus, all the concern about “security and stability.” With no functioning government, calm prevailing, and people self-organizing, “security” does not mean safeguarding the population; it means securing the country against the population. “Stability” does not mean social harmony; it means stability for capital: low wages, no unions, no environmental laws, and the ability to repatriate profits easily. There is far more in Arun Gupta’s article about the connection between, and history of, US military occupation and neoliberal capitalism in Haiti. 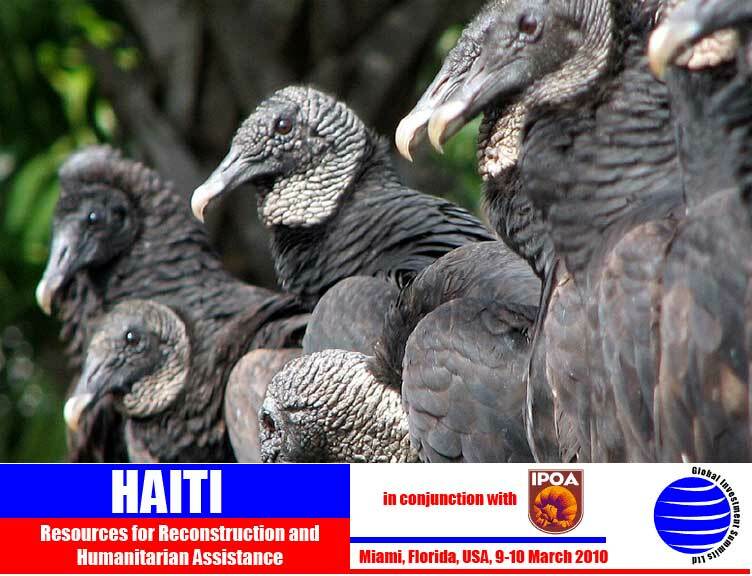 … the catastrophe in Haiti revealed the worst aspects of the U.S. government and the NGO aid industry. Third World NGOs have proven brilliant at co-opting local leadership as well as hegemonizing the social space traditionally occupied by the Left. Even if there are some celebrated exceptions–such as the militant NGOs so instrumental in creating the World Social Forums–the broad impact of the NGO/”civil society revolution”…has been to bureaucratize and deradicalize urban social movements. Davis argues that NGOs are, in fact, a form of “soft imperialism.” They play a role very similar to the one that missionary religious institutions played in the earlier history of empire. They provide moral cover–a civilizing mission of helping the hapless heathens–for the powers that are plundering the society. And just as religious institutions justified imperial war, many NGOs, abandoning their traditional standpoint of neutrality in conflicts, have become advocates of military intervention. Nowhere is this pattern more clear than in Haiti. Haitians now commonly refer to their own country as the “Republic of NGOs.” But that is a misnomer, since Haitians have no democratic control over the NGOs. In reality, Haiti has been ruled by an American NGO Raj. … NGOs aided and abetted the “plan of death”; exacerbated through failure, mismanagement and corruption the impact of neoliberalism on Haiti; and then supported the coup against the democratically elected government. In so doing, they undercut the sovereignty of Haitian people, all under the gloss of helping people overcome their poverty–poverty that they, in fact, helped create. Haiti deserves help that actually helps, or deserves to be left alone. The Haitian people are enterprising and can take care of their country and their people. We all owe Haiti a debt, moral and monetary. Instead Haiti is treated to exploiters and thieves. The country that led us out of slavery is having neoliberal neoslavery imposed on it at gunpoint, by the US and the international community, with mercenaries as the enforcers. I surely hope the Hon. Collins Dauda is correct. Industry sources say the crude found off Ghana is of a quality even easier to refine than the light, sweet crude found in Nigeria, one of the world’s largest oil producers. Revenue derived from oil will be invested in the national power supply, with improvements to the road network and water supply, construction of a deep sea oil port and revamping railway lines, Atta-Mills said. Dr Aning said there is a general lack of seriousness in ensuring the country’s boundaries are protected. Ivory Coast has sent the government of Ghana a correspondence expressing outright disrespect for an existing “median line” that divides the two countries. The Francophone country consequently served the United Nations with a similar correspondence saying it does not respect a temporary boundary between the two countries. The Ghana Government is expecting Parliament to quickly deliberate on a bill that would establish a boundary commission to negotiate Ghana’s maritime boundaries with Ivory Coast. The Ghana Boundaries Commission Bill has been sent to Parliament under a certificate of urgency, Lands and Natural Resources Minister Collins Dauda told the Super Morning Show on Thursday. “A national boundaries commission will be put in place that would engage our neighbours in La Cote d’Ivoire with a view of negotiating our maritime boundary between ourselves and our brothers in Ivory Coast,” he said. Dr Aning said the bill must be given a strong bi-partisan urgency to ensure that the country derives the most out of its oil resource. The security expert is also recommending a solid technical documentation studied by lawyers with expertise on petroleum matters. The Lands and Natural Resources Minister says the emerging claim from Ivory Coast for portions of the oil fields in the Western Region is a very delicate matter. Collins Dauda said the issue has serious international and diplomatic repercussions. “We have not been able, as a country, to determine our boundary with Ivory Coast and there is the need for us to now determine the maritime boundary between Ghana and Ivory Coast,” he said. Mr Dauda however said both countries have, for years, respected “a median line” between them that cannot be trespassed. “All of a sudden, with the oil find, Ivory Coast is making a claim that is disrespecting this median line we have all respected. In which case we would be affected or the oil find will be affected,” he said. The Lands and Natural Resources Minister said the claim by Ivory Coast is baseless. Collins Dauda said, last year, Ghana appealed to the United Nations to extend its maritime boundary by 200 nautical miles. As a precondition, the UN directed the country to negotiate boundaries with its neighbours, he disclosed. The latest turn of events may even be more surprising as Ivory Coast has already sent a correspondence to the Republic of Ghana, expressing disrespect for the median line the two countries have agreed upon for years. Consequently, Ivory Coast has made a submission to the United Nations laying claim to portions of the Ghana’s oil find. ACCRA, Ghana–(BUSINESS WIRE)–The Government of the Republic of Ghana, the Ghana National Petroleum Corporation (GNPC), Vanco Ghana Ltd. and LUKOIL Overseas Ghana Ltd., signed a new Petroleum Agreement, covering the Cape Three Points Deepwater block. This agreement will replace the existing Petroleum Agreement which expires at the end of April 2009. The new agreement provides Vanco and LUKOIL with the opportunity to continue the exploration of the area, during which new 3D seismic and additional drilling activities are planned. The new agreement also provides GNPC and the government of Ghana with significant commercial benefits, including higher royalty and increased GNPC participation. The new Petroleum Agreement also gives ownership of Associated Gas to the State. The Cape Three Points Deepwater block encompasses an area of 5,146 square kilometers in water depths ranging from 200 to 3,000 meters in the Tano Basin. Vanco (Operator) holds a 28.34% participating interest in the Cape Three Points Deepwater block with LUKOIL holding a 56.66% participating interest. GNPC, the state oil company, holds a 15% carried interest, with the option to acquire up to an additional 5% in any commercial discovery. The new agreement comes as the Aban Abraham deepwater drillship departs Cape Town, South Africa after completing final retrofit operations to enable the unit to drill in water depths of up to 2,000 meters. 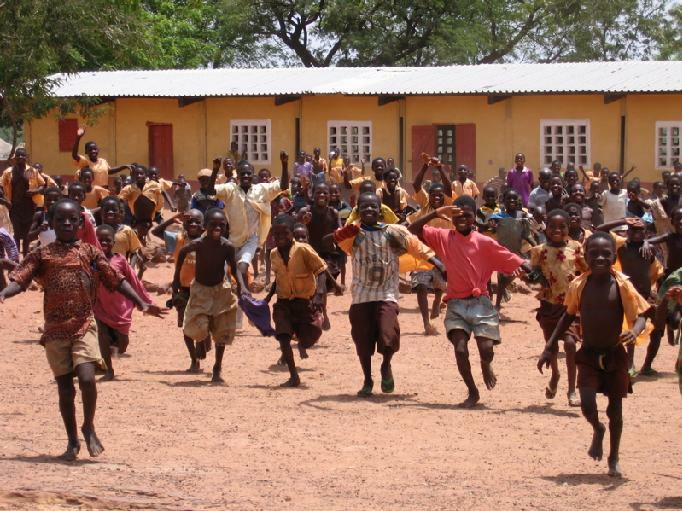 The Aban Abraham will mobilize to Ghana to commence the Dzata-1 exploratory well by the end of April 2009. Situated in 1,874 meters (6,148 feet) water depth, the Dzata Prospect is a large anticlinal structure with numerous Upper and Lower Cretaceous potential reservoir horizons and distinct direct hydrocarbon indicators, including flat spots and a “gas chimney.” The well will be drilled to a total depth of approximately 4,786 meters, or 2,912 meters below the mud line. Vanco is a leading deepwater independent with activity in Côte d’Ivoire, Ghana, Equatorial Guinea and the Ukrainian Black Sea. The Dzata 1 discovery is the latest in addition to the Jubilee and other oilfields where significant hydrocarbons have been found. There are speculations that the Dzata 1 discovery which is close to the Ivory Coast boundary may be a contributory factor to Cote D’Ivoire’s claims. But Mr Mitchell told Citi News from his base in the US that that may not be the case since the Dzata Well is over 200 kilometers away from Ghana’s maritime boundary with cote-d’Ivoire. Meanwhile, Security Analyst Dr Kwesi Aning says Ghana must take a firm stance as it seeks to enter negotiations with the Ivorians and desist from using the humanitarian approach. “More often than not, when these problems arise, there is a certain naivety on the Ghanaian side, a certain humanitarian approach, saying we are all brothers and all that – we are not brothers”. “The Ivorians have a rationale choice attitude to this, they have made their calculations and they are willing to push this demand as far as possible to get what they want and I think it’s crucial that this bill is passed under the certificate of urgency and hopefully, the team that will be put together should be a bi-partisan group of technical experts with the requisite knowledge to ensure that this issue does not become a problem.” He told Citi FM. He, therefore, advised Government to ensure the passage of the law immediately and provide the requisite resources for a bi-partisan group to promote Ghana’s interest in the matter. Dr Aning warned that if the right steps are not taken to deal with the situation immediately, Ghana and Ivory Coast may replicate the conflict that ensued between Nigeria and Cameroun over the Bakassi peninsula. A Fellow at the Legon Centre for International Affairs, Dr Ken Ahorsu says the current scramble between Ghana and its neighbor Ivory Coast over the Dzata oil well is not irresolvable. He has warned however that the French Government could support Ivory Coast against Ghana in the eventuality that the issue blows up beyond the sub-region. He says the situation could be handled satisfactorily to avert a repeat of the Bakassi Peninsula incident as pertained between Cameroon and Nigeria. Dr Ahorsu told Citi News that the African Union must first come into the fray before the matter is taken to other international platforms if possible. 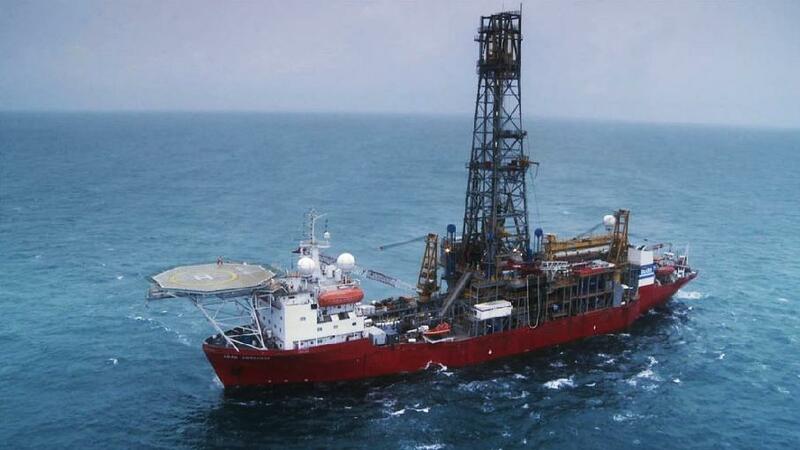 Ivory Coast has already made a complaint to the UN laying claim to the Dzata well discovered by Vanco oil recently in the Cape Three point fields. “Ghana really has to do its home work because the Francophone countries have a very firm supporter in France. If you follow the court ruling of the Bakassi Penninsula between Nigeria and Cameroon, internationally everybody believed that France had a huge role to play that influenced the final outcome. “I don’t want to suspect but I have this uneasy feeling that Ivory Coast might have started stirring the International waters, given the knowledge that they believe they have a supporter in the International system but…I have looked at it from the internet, I have looked at where the new oil is found by Vanco and I don’t think it’s within Ivorian waters.” He said. According to him, the Government of Ghana has done the right thing by putting together a Border Commission to deal with the issue. Dr Ahorsu believes delimitation of the maritime boundaries between the two countries should not be a difficult task to carry out. Petroleum exploration firm, Vanco Ghana Limited, has dismissed suggestions that its oil field in the Western Region is at the centre of a possible boundary dispute between Ghana and the Ivory Coast. The company says its oilfield, known as Gyata 1, is so far away from the maritime boundary between the two countries that it cannot be the subject of any dispute. Country manger of Vanco Limited, Kofi Afenu, says the Ivorian authorities are only seeking negotiations with Ghana over the Jubilee oilfield, which is owned by Kosmos. “The distance between the boundary line and then the Gyata 1 well is more than 200 miles…quite far,” Mr Afenu told Joy News’ Sammy Darko. The Vanco country manager is amazed at news making the rounds in some sections of the media that Ivorian authorities are demanding portions of Ghana’s oilfield. According to him, the closest well to the Ivorian border is the Jubilee field which is some 60 miles away. Under no circumstance will Ivory Coast lay claim to the Gyata 1 well which is several miles away, Mr Afenu indicated. The media may have blown the issue out of proportion or perhaps the minister sent the wrong impression to Ghanaians that Ivory Coast is demanding a portion of Ghana’s oil fields. The facts as discovered by the Myjoyonline.com indicate the Ivorian authorities are only calling for a negotiation of the maritime border between the two countries. La Cote d’Ivoire has not laid claim to any portion of Ghana’s maritime space, authorities indicate. Meanwhile, Parliament is expected to quickly deliberate on a bill that would establish a boundary commission to negotiate Ghana’s maritime boundaries with Ivory Coast and other neighbouring countries. The Ghana Boundaries Commission Bill has been sent to Parliament under a certificate of urgency, Lands and Natural Resources Minister Collins Dauda has said. “A National Boundaries Commission will be put in place that would engage our neighbours in La Cote d’Ivoire with a view of negotiating our maritime boundary between ourselves and our brothers in Ivory Coast,” Mr Dauda said. 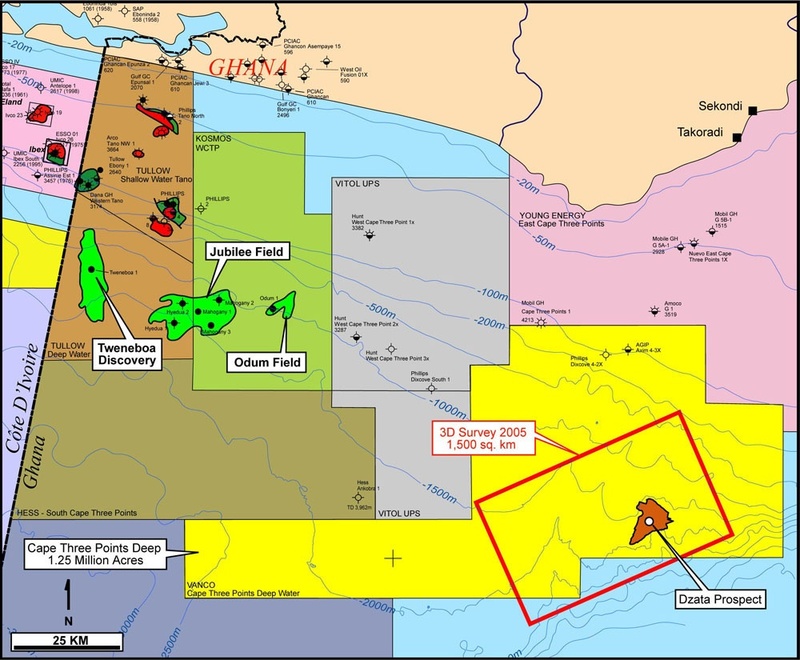 A map of the area in contention shows no part of Ghana’s oil field is in danger of a seizure.